Medical allowance or reimbursement is a financial help that employers provide to the employees for several medical treatments. This allowance is provided to eligible employees every month along with their basic salary. As per the rule of medical allowance even when employees do not produce a bill or didn’t require any medical benefit in each month, still the employer will have to pay the allowance. A lot of people get confused between medical allowance and medical reimbursement. By the reimbursement it means that beneficiary can reimburse the entire cost of any medical procedure he/she has undergone. Though medical allowances are not exempted from tax slabs, but in 2016, 7th CPC has set some new rules for the same. Pensioners are also eligible to draw medical allowance. As per the Income Tax rules, medial allowance will be provided to each deserving employee up to a specific limit. Up to the said limit the medical allowance will not consider as taxable income. On the other if the beneficiary needs to pay more than the fixed allowance for medical purpose the rest amount will fall under taxable income. Also as per the rule, in case of medical reimbursement, employees must produce the medical bills before ITR filing. If they don’t do that 30% of the limit will be considered as taxable income, though employees can claim that later. Medical allowance, unlike other governmental allowances, does not have any percentage or rate at which the benefit is been paid. There is an upper limit beyond which the amount will fall under tax slabs, in medical allowance. The limit for the medical allowance is Rs. 15,000/- per annum. As per the Income Tax Act, 1961, the upper limit of the medical allowance is Rs. 15,000/- per annum. Up to this amount no tax will be levied on the medical benefit received by any governmental employee. If the limit gets crossed then the rest amount has to be paid by the beneficiary and also a said tax rate will be levied on the rest amount. If these are being followed, the medical reimbursement of up to Rs. 15,000/- will not be considered as taxable allowance. The medical allowance tax exemption limit is set at Rs. 15,000/- per annum. Employees who are receiving this allowance need not to pay any tax on medical benefits up to Rs. 15, 000/- in an assessment year. Each employee will receive Rs. 1250/- per month as a medical benefit whether they need it or not. On the other, for reimbursement he/she needs to submit the hospital bills before time of ITR file. If he/she doesn’t do so, 30% of the limit will be recorded as taxable amount. Pensioners are also eligible for the medical allowance. In 2016, the 7th CPC has declared the increased amount of medical allowance for the pensioners. The retirees who don’t fall under the area of central government health scheme, will get Rs. 500/- as medical allowance for their regular OPD/IPD checkups. People who don’t need to get hospitalised but are required to visit the doctor every month with now get a revised allowance i.e. Rs. 500/- which is more than the previous rate Rs. 300/-. 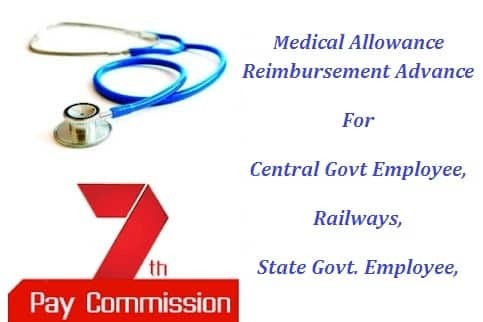 According to the regulations retired railway and central government employees and their family members can avail medical treatment from central government health scheme. Even if they didn’t take any facility during their service they still can take the facility form the CGHS hospitals. Those who do not live within the CGHS area can also take the facility by registering themselves in near CGHS centre. This is a type of medical allowance which is given to the employees of govt. as well as some private sectors. Medical advance is generally not given in case of minor issues. When the employees undergo medical treatment which is so expensive that they cannot bear the costs of treatment, then the employer provides them medical advance for their treatment. There are instances when the Govt. or big private sectors grant this medical advance benefit to its employees in case of foreign treatment for bigger diseases. But there are several regulations made by the govt. on the method of claiming of the medical advances. The Central Govt. of India provide medical advance to its employees through CGHS. As per the guidelines of CGHS, the employees of the central govt. are eligible to get free and easy access to the medical advance benefit in case of prolonged medical treatment. The disbursement of medical advance will be done after the claim process of treatment costs is properly initiated from the employee end. The medical advance is given in total to the employees who have residence in CGHS zones. Those who do not reside in the CGSH areas are eligible to get claims for the total treatment costs from CSMA. The doctors who have been appointed for CSMA areas are referred to as Authorized Medical Attendants (AMA). The subscribers of the central govt. scheme to provide medical insurance get medical advance facilities as per the CGHS rules of the health scheme. The medical advance is provided only for the indoor treatment of the CGHS members. This means if a beneficiary takes the option of outdoor treatment and claims for the costs, then he / she is not eligible to get any medical advance for that case. A CGHS beneficiary can claim a maximum of 90 per cent of the total CGHS package cover or the total medical treatment costs (the lesser amount to be considered) for major treatments like kidney transplant, cancer, bypass surgery, etc. The claims for medical advances will be paid either in a single installment or by multiple installments to the beneficiary. 5 Link to download medical advance claim form http://cbecddm.gov.in/form/Medical_reimbursement_30jan14.pdf. All the CGHS beneficiaries are eligible to get the medical advances as per the CGHS guidelines. The central govt. employees are brought under this health scheme for its employees, which provide easy and affordable medical insurance. At first the treatment of the CGHS beneficiaries has to be initiated in the CGHS hospitals and dispensaries. For outside treatment, the recommendation of CGHS doctor is needed. In case of emergency, the CGHS beneficiary must get emergency certificate from CGHS doctor. As per the guidelines of Ministry of Health, all the central govt. employees will get benefits of medical advance. It is essential to become the beneficiary of the CGHS scheme beforehand to get this free medical treatment facility. For making claims of medical advance, the central govt. employees must get treatment or treatment recommendation from CGHS hospital. There is a format of application form which is to be duly filled for claims of medical advance under the CGHS scheme. The form is available in the CGHS offices and hospitals. It can also be downloaded from the link: http://cbecddm.gov.in/form/Medical_reimbursement_30jan14.pdf. The medical advance bill form is a part of the claim form for medical reimbursement under the CGHS. All the bills such as doctor fees, bills of medicines purchased, bills of all the medical tests undergone, etc. are to be filled in the medical advance bill form.